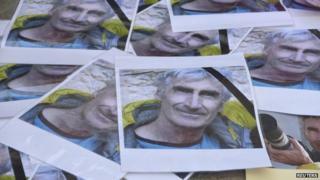 Algeria's defence ministry says troops have killed the leader of a jihadist militant group which kidnapped and beheaded French tourist Herve Gourdel. Abdelmalek Gouri and two associates were shot dead late on Monday in the town of Isser, a statement said. His group, Jund al-Khilafa (Soldiers of the Caliphate), pledged allegiance to Islamic State (IS) in mid-September. Days later, it seized Mr Gourdel in the Djurdjura mountains and killed him in response to French air strikes on IS. The Algerian army subsequently launched a major operation to track down members of Jund al-Khilafa, which has seen several of them killed. The defence ministry statement said the operation in Isser began at 22:30 (21:30 GMT) on Monday after intelligence was received and a vehicle carrying militants was seen entering the town, 60km (37 miles) east of Algiers. After Gouri and the two other members of Jund al-Khilafa were killed, troops recovered two automatic rifles, explosive belts, a large quantity of ammunition and mobile phones, it added. No other people were reported injured in the clashes. On Saturday, the army announced that it had killed three other militants in a mountainous area near the village Sidi Daoud, 25km (15) miles to the north-west of Isser. It said one of them was a "dangerous criminal". And on 11 December, the justice ministry said soldiers had killed two members of Jund al-Khilafa implicated in the murder of Mr Gourdel. The newspaper Ennahar cited security sources as saying the group mostly comprised former members of al-Qaeda in the Islamic Maghreb (AQIM). On 14 September, Jund al-Khilafa broke away from AQIM, accusing it of "deviating from the true path", and pledging allegiance to IS leader and self-proclaimed "caliph" Abu Bakr al-Baghdadi. The group kidnapped Mr Gourdel in Djurdjura National Park on 21 September. Three days later it published a video that appeared to show him being beheaded after its demand that France end its air strikes on IS positions in Iraq was not met. Gouri, also known as Khaled Abou Slimane, was once considered the "right-hand man" of AQIM leader Abdelmalek Droukdel and was part of the cell behind suicide attacks on the government's headquarters and the UN compound in Algiers in 2007, Ennahar said. He was also behind an attack in Iboudrarene in April that left 11 soldiers dead, the newspaper added.